It’s day 2 of Social Media Week Lagos, and today we are excited to share the stories of how we got started. 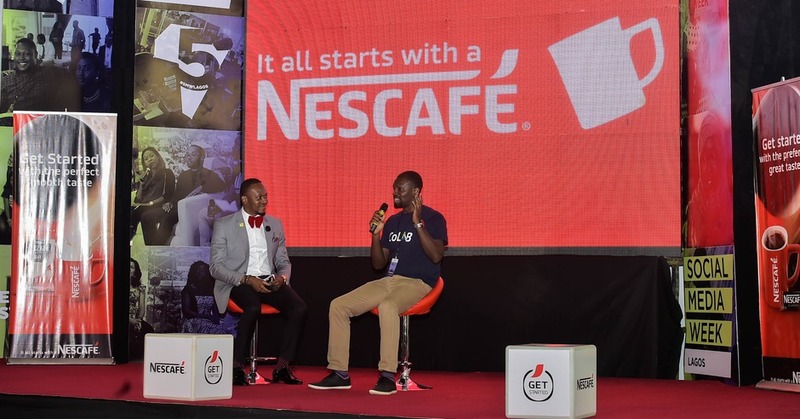 This session was hosted by Nescafe who are one of the sponsors of Social Media Week Lagos. We have four speakers for this event, and they are; Soul Fusion musician, Falana, Tech expert, Sanusi Ismaila, Food blogger and caterer Atim Ukoh and Enitan Denloye, a brand strategist. One of Nigeria’s finest music exploits, Falana is our first speaker. Having developed a love for music since she was a little girl, she decided to toe that path. Her early influences were greats like Sade Adu, Fela and Lauryn Hill. Falana advises young people to look at the lives of people they look up to, and study how they go started in order to be inspired. Even though she has lived in Cuba, Canada and other parts of the world, she doesn’t put herself under any pressure to pattern her music to the taste of any place as she believes music is universal, and those who appreciate her brand of music will embrace it. The second speaker, Sanusi Ismaila describes himself as “crazy about technology.” He is a tech consultant and founder of COLAB, a Co-creation hub working space based in Kaduna. Sanusi worked at MTN Nigeria for five years, and resigned when he felt it was time to start up his own tech company. He was inspired by his need to always solve problems, as he found himself breaking and fixing gadgets as a child. Having lived in Sokoto for 12 years, the internet and social media helped him gain access to the rest of the world. “There are no boundaries anymore, the boundaries you think exist are only in your mind” says Sanusi. Atim Ukoh’s love for food was the determining factor in her decision to eventually become a food blogger and caterer. Our third speaker realized social media would really help her business when she moved to San Francisco. Atim opines that beyond being passionate about what one does and getting a degree, it’s important to keep updating oneself on the necessary skills required to get better at your business. She took a course in photography to in order to be able to take better pictures for her blog. Atim also believes it only makes sense to use social media to project all you do. The final speaker of the day, Enitan Denloye is a brand expert who was singled out by the vice-president of Procter & Gamble to work on one of their most important brands- Ariel. He was also a part of the team that executed the hugely successful “Data is life” Airtel ad campaign. Enitan reveals that the beauty of social media is not just in communication, but engagement. The ability to get instant feedback from the audience/consumer. He advises young people to find a way to stand out from the pack and differentiate themselves, especially since money is almost always a limiting factor for them. He leaves us with this words – Go for it! And never take no for an answer.